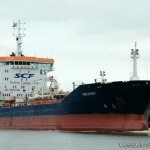 The 80 meter long self-propelled barge Ella collided with the 144 meter long tanker Mar Elena 1 at Hamburg, Germany. 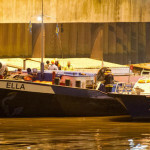 The Ella was proceeding from a quay into the turning basin when it was spotted by the Mar Elena 1. The tanker reversed engines and turned hard to port to avoid the collision, but it still swiped the barge with its forepeak. The Ella sustained multiple hull breaches and its cargo holds began to flood. Authorities quickly responded to the scene with dewatering pumps. Pumps ran continuously while several other barges were brought to the scene to help lighter the Ella’s cargo of 1100 tons of wheat. 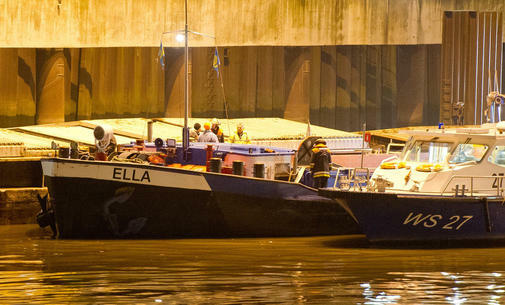 Divers were later able to make temporary repairs to allow the Ella to proceed to a shipyard. The Mar Elena 1 was allowed to proceed on its voyage to Oxelösund. The water police has launched an investigation into the incident. Reports state that alcohol and drug tests were negative. On January 19, The 12 meter long fishing vessel Bärbel sank off Nagu, Finland. The Bärbel was fishing when it developed a list to starboard and began to fill with water. The two crew on board abandoned ship and rescued by a nearby trawler Huovari. The Bärbel sank a short time later in 30 meters of water. Authorities dispatched a patrol vessel and helicopter to the scene to inspect the area for any pollution released. No further details reported. 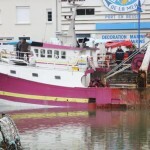 On January 18, the 16 meter long fishing vessel Ptit Djimy suffered water ingress while berthed at a quay in Port-en-Bassin, France. 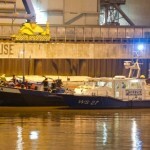 The local authorities were alerted as the vessel began to sit lower in the water. The local fire brigade responded to the scene with several dewatering pumps. After a few hours, the pumps were able to dewater the Ptit Djimy. No injuries, damage or pollution released. Reports state the bilge pump was the source of the water ingress.